Cycling is a sport that is on a rise in the Czech republic. Many bicycle paths have been built throughout the Czech Republic in the recent years. The city of Prague supports the biking sport within Prague by building bicycle paths and by extending options of using the public transport system for bike transportation. Bikes can be transported on each first and last platform of each carriage except the first platform in the driving direction. Each platform has maximum capacity of two bikes. The lifts are currently available at metro stops: Bořislavka, Černý Most, Háje, Chodov, Ládví, Letňany, Národní třída, Nemocnice Motol, Pankrác, Prosek, Roztyly, Skalka, Střížkov. Transportation of bicycles in metro is free of charges. Bikes can be transported only on selected tracks in direction outside the city center and up the hill with exception of working days between 2-7 pm. Bikes can be transported only on places for transportation of strollers, either at the end of the carriage or on one of the inside platforms. Maximum capacity of each platform are two bikes. 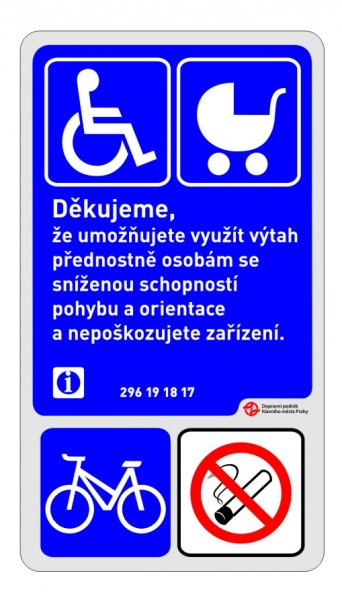 You shall give a signal to the driver when boarding with a bike (by raising your hand upon approaching of the tram to the tram-stop and making an eye contract with the driver). Signal the driver also your plan to depart the tram (double ring while approaching your destination stop). Transportation of bicycles on trams is free of charges. It is not allowed to transport bicycles on the buses. Have fun biking in Prague!